“My name is Denis Joseph. I am 38 years old. I am from Imo state, Owerri North Local Government Area. I was born in Port Harcourt. 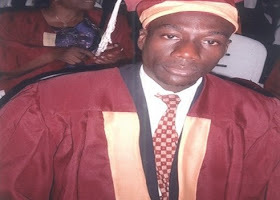 I graduated from Enugu State University of Science and Technology, Enugu. Presently I am into the distribution of Nestle products in Lagos and other states of the Federation. Recently a customer called me from Ikorodu that he needed some products urgently and that I should come and see him for proper negotiation before the second day. At about 2pm the following day, I boarded a Siena minivan from Ojota .We were about five in the vehicle including the driver of the vehicle I asked them how much was the fares and they told me it was #200. I said it was okay since the vehicle would be faster, I said no problem. I was in a hurry to catch up with my appointment. As we were going ,my spirit was very cold. I now flashed back to what happened at Ojota, shortly before we took off. I discovered then that some people in an attempt to enter the vehicle held back. they did not enter the car. It was unusual for my spirit to be so cold like that if there was no eventuality or imminent danger. As we moved further since my spirit was not willing and becoming uncomfortable in the car, I told the driver,’ Oga , please stop me here, I told them felt like continuing with the journey, let me pay you your correct fare. The driver responded that he could not stop at the place they were because it was dangerous since it was an expressway more so because of the law enforcement agents. I said please stop me let me get down here, the journey meant nothing to me again but he refused. He accelerated the speed. I told him it is not dangerous for him to stop and that I could see vehicles stopping and people moving about freely and that there was no danger in it. Before I knew what was happening, he increased the speed. In the process it became dawned on me that the occupants were not normal people. So I started struggling with them to go out. They started saying their incantation. Their invocation was so much that I knew it was only God that could save me at that point even though I believed that as a Christian, I would not die in the hands of those people. My escape was not possible because I was sandwiched by two men on my sides, with another at the back. I started shouting in the vehicle; leave me I want to go out. But my shout was inaudible since the windows were closed. Because of the way we sat there was no way I could jump out easily. Then I hit on the car, I hit on the other side, all my hands got bruises in an attempt to escape danger and death. Blood started coming out of my hands. I found out that they don’t want to stop as I was shouting and screaming. One of them said to me that why are you proving too stubborn, don’t you see other passengers in calm position. I did not even mind him. All these things happened shortly after Owode, Mile 12 area of the state. As I was doing that, one of them told the driver that we better hurry up o, this guy is proving too stubborn. They said this guy is not the type of person we need o, we better hurry up. It was when they started saying this that I discovered that they were not ordinary people and out to harm me. Fortunately for me and bad for them and through divine intervention and on coming trailer from the other side had blocked the road and the car could not penetrate the small opening. The car could not bypass the big trailer so it had to stop. I continued shouting. That was how they stopped abruptly and I came out of the car. Then some Policemen and people came round to inquire about what was happening. I narrated everything to them and they arrested the remaining occupants. They started asking them why are you doing this? The Police searched the vehicle and found dangerous weapons, charms, knives and all those fetish things. Me I started thanking God for delivering me and rescuing me from their hands left the place. I did not follow those apprehended to the Police. For the fact that I came out of the vehicle safely was okay for me. God just saved me miraculously from those people. So I thank Him. Because if not God I don’t know if I could have survived it. Those people are ritualists because they did not even asked me for money. They were only after my life. My advice to people going on a journey is for them to pray before they go out. So as to prevent unexpected mishaps. They also have to be careful and look well before boarding any vehicle. The Police too need to be in strategic places so that they would know who is who during the day, afternoon and at night. Even when people are shouting or struggling inside the car or bus, they will be able to respond easily and follow up the vehicle. That was what helped me and people started to come round to help me.”he said.